‘Driving innovation in policing’ is the tag-line of EMPAC. And two of the police forces in EMPAC are leading the way in the adoption and implementation of the ‘Crime Harm Index’ (CHI), developed at the University of Cambridge. 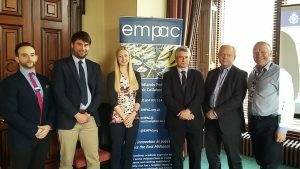 Earlier this week EMPAC took representatives from Leicestershire Police and Northamptonshire Police to an event hosted by the Scottish Institute for Policing Research (SIPR) to explain the opportunities, challenges and implications of adopting the CHI to colleagues in policing, government and academia in Scotland. The CHI was described as providing a step towards capturing the level of harm caused by criminal offences rather than the traditional assessment primarily by volume alone. The workshop provided a space in which colleagues engaged in lively debate about the methodological, moral, ethical and practical issues and approaches of using the CHI in understanding crime in society. In policing, crime is overwhelmingly measured and understood in a framework of volumes, in which all crimes essentially have equal weighting. The Crime Harm Index seeks to provide a different lens through which to understand the crime impact and demand, through applying a score that is based on the minimum sentence applicable to each offence. Assessments of crime harm against crime volume present different trends over time and geography, showing an increase in harm over the past twelve months (compared to a decline in reported crime figures) and highlighting different ‘hot spot’ locations to those traditionally focussed upon due to high volumes of offences. Senior leaders and analysts in policing suggested that this different lens through which to understand crime and to see its impact will encourage a review of how resources are directed and deployed, moving away from over-reliance on visibility and foot-patrol in ‘troublesome’ locations, towards tackling less visible harm such as cases of domestic violence and protecting children. One common challenge raised by attendees in Edinburgh was that, although the CHI places a score on the degree of harm caused by a crime, it does not measure harm specifically in relation to the experience or the vulnerability of a victim and it cannot include the wider impact of harm on families and communities. The relationship between the score and sentencing led some to question whether it was actually a sentencing index rather than a harm index, as minimum sentencing was argued not to reflect actual experience of harm. The answer provided by analysts from Leicestershire and Northants was that the CHI model is not perfect, and that rather than claiming to provide a totally accurate picture of the impact of crimes, it is a simple and effective way to capture the complexity of crime demand that takes into account more than just volume measurements. Moreover, it is an improvement on the way that crime volumes have been measured historically, and the developing iterations that both forces have made to the University of Cambridge model demonstrate that this is, and will continue to be, an evolutionary rather than revolutionary process. This raises an important debate about the importance of consistency in the measurement of crime and the impact of crime. Northamptonshire Police and Leicestershire Police have implemented adaptations to the Cambridge model and intend to keep doing so to increase the sophistication of the model to bring in wider measures of deprivation and vulnerability, for example. The Office of National Statistics also use a model for the measurement of crime harm which uses average sentences rather than minimum sentences to provide scores against offence type. This creates challenges for generating a consistent picture of crime harm at the national level, which could be used to facilitate national policy development and to stimulate assessment across geography and other factors. However, iterative developments in these types of models leads to greater sophistication, more applicable data and insight and drives ownership and commitment to continue to develop understanding of crime harm. The question then is whether these benefits of flexibility and development in measurement practice outweigh the opportunities that arise through having a national picture and comparative data between areas. In terms of applicability in Scottish law enforcement, representatives of Police Scotland highlighted the lack of Scotland-specific sentencing guidelines as an issue in adopting the CHI. Additionally, due to the amalgamation of eight police forces into one, there are a number of different crime systems in operation which means collation of data to inform the CHI will be problematic. Scottish police representatives were positive about the potential of the CHI, suggesting that it could be a “useful tool in the box” for directing resources to tackle the most harmful crimes. The challenge, as will be the case across the whole UK, is using this (or any) new model to redistribute resources potentially away from crime types, offenders and areas which have often been a focus for decades. The legacy of the political drive to reduce ‘all crime’ continues, which means that in many areas resources continue to be directed towards high volume offences such as theft, as opposed to domestic and sexual violence, for example. In addition to these challenges, measuring crime in relation to harm presents a worsening picture, which may impact on public confidence, political narrative and in turn may challenge support for new ways of understanding crime harm. Finally, one of the biggest considerations for attendees at the workshop going forward is how we seek to measure the impact of the CHI, on policing, on crime prevention, on bringing offenders to justice on protecting people from victimisation. Accepting that the CHI pushes police attention beyond volumes and towards harm, how this insight will be used is yet to be assessed. Of particular interest to colleagues across EMPAC and SIPR, is the purpose of this model, which could be used for setting priorities, directing resources, informing service design, evaluating impact of services and interventions, comparing approaches and geographies, providing a strategic picture of crime harm or providing specific assessments of offences, offenders and victims, and much more. The links between an index of crime harm and the various models of performance management in policing, across police leaders, Police and Crime Commissioners and Her Majesty’s Inspectorate of Constabularies, are yet to be explored. These are the ideas and challenges for collaborations like EMPAC and SIPR to address, through bringing policing, academia and policy-making together.